It was warm and sunny Saturday evening when approximately 120 people gathered in support of the use of animals in biomedical research at the corner of LeConte and Westwood on the UCLA campus. Pro-Test for Science organized the event in response to a demonstration organized by Michael Budkie (Stop Animal Exploitation Now!) that was taking place simultaneously across the street. Like the April rally, our group was composed of members of the entire biomedical research family (faculty, physicians, students and animal care staff). Theirs, as far as we could tell, was composed from representatives of animal rights organizations to a few individuals covering their faces with bandannas and sunglasses. Their group totaled about about 50 people. Despite various attempts from animal right activists to provoke us by crossing the street and occluding our signs, or by conducting video interviews that would be more appropriately described as interrogations, our group remained calm and explained our reasons for being there in support of research. One encouraging sign that some progress is being made was that some activists crossed the street to debate our mutual positions in a civil way (as civil as we have ever seen), not just screaming at us, but stopping to listen as well. Others, unfortunately, decided to stay on the other side and continue their usual screaming of obscenities and threats through bull horns, claiming that science has never produced relief for human suffering, that scientists are only after the money (along with many conspiracy theories), and that we deserve to be the targets of violent attacks. Many openly argued that any well-respected social movement is entitled to their underground terrorist wing. We know for a fact that a number of animal right activists left at this point in disgust. Their group lit candles to honor the lives of the animals used by UCLA. Our group lit candles too. They were to honor both the lives of the animals as well as to those of the thousands of patients dying today across the world from multiple diseases we are working to find cures for. Overall this was a very successful event. Our message was heard loud and clear. Pro-Test for Science will always be there to stand for the responsible use of animals in research. We will be there to present our side of the story; to counteract the mis-information and mis-representation of our work by some animal right activists. We will be there to talk to whoever wants to engage in a civil discussion, and to condemn those that support violence. If there was one clear take home message is this: every day more and more scientists are deciding that it is time to voice their opinions and to stand up for research. Pro-Test for Science is now here to stay, to spread across US campuses, and reach out across the ocean to join the global movement of scientists, policy makers and the public that will defend science, reason, and the responsible use of animals in biomedical research. 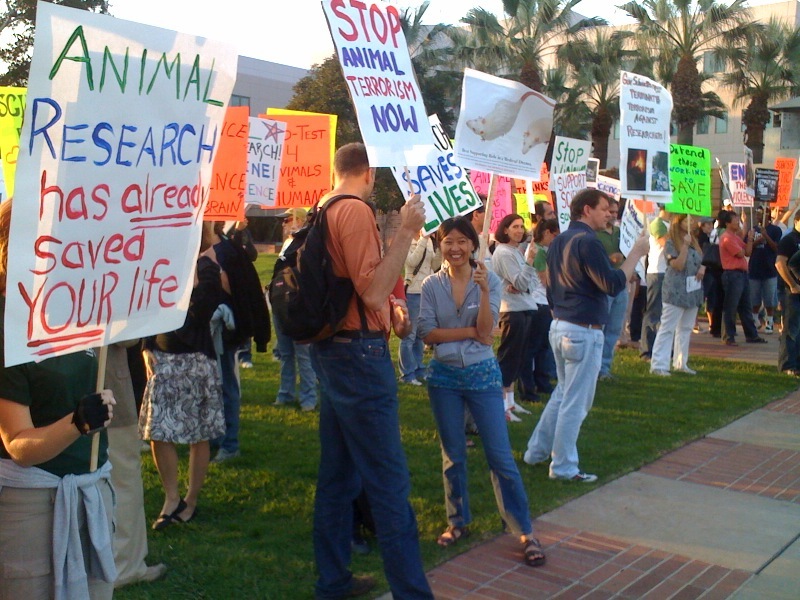 Posted on October 28, 2009 April 22, 2014 by EditorPosted in Campus Activism, NewsTagged animal rights, animal rights extremism, ARE, Budkie, Dario Rinach, david jentsch, gathering, pro-test, pro-test for science, SAEN, ucla, UCLA Campus, violence.